American actress Carrie Fisher is most famous for her role as Princess Leia in the Star Wars movies. During the 1970s and 1980s, she starred in the films alongside actors Harrison Ford and Mark Hamill. This year, the three reunited for Stars Wars: The Force Awakens. Fans of the films eagerly awaited the trio's return to the big screen. Fans and movie critics have applauded the latest Star Wars film. But on social media, a major topic has been Carrie Fisher's physical appearance in the film. Fisher was only 21 when the first Star Wars movie was released in 1977. She is now 59 years old. On Twitter, some fans criticized her appearance in the latest movie, and said the star had not "aged well." On Tuesday, Fisher responded to the criticism. She tweeted: "Please stop debating about whether or not I aged well. Unfortunately it hurts all 3 of my feelings. My body hasn't aged well as I have..."
She also retweeted a message from a supporter that read: "Men don't age better than women, they're just allowed to age." Fisher's own response to the criticism has been retweeted more than 38,000 times. Fisher speaks often about the difficulties of aging in Hollywood. In an interview this year with a British magazine, she said, "I'm in a business where the only thing that matters is weight and appearance. That is so messed up." Supporters have appreciated Fisher's honesty in recent interviews and on Twitter. 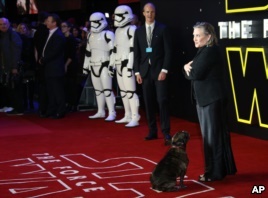 Twitter user JCKNN wrote: "Every interview I've seen with Carrie Fisher for The Force Awakens has been pure gold. She's just the best." And that's What's Trending Today. I'm Jonathan Evans.